Or, to give her her proper birthname, Archduchess Maria Antonia Josepha Johanna von Habsburg-Lothringen, fifteenth child of the Holy Roman Emperor Francis I Stephen (né François-Etienne de Lorraine) and his wife, Empress Maria Theresa. The little Archduchess was born at the Palace of the Hofburg in Vienna. Within the imperial family the little girl was simply called Antonia, Antoine or Antoinette. Eighteen years later she would become Queen of France under the name of Marie-Antoinette. Here she is as a baby (lying in the gilded cradle at the center of the picture) surrounded by her parents and siblings. This was painted in 1755, when she could not be more than two months old. It must be the earliest of her many portraits. 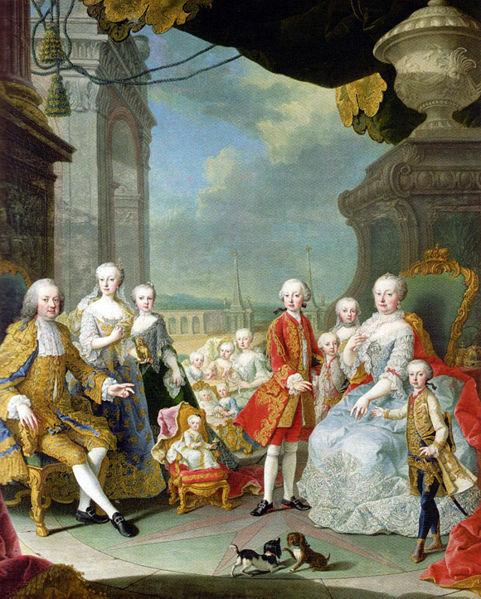 Martin van Meytens, official painter of the Viennese Court, made several versions of this life-size picture of the Familia Augusta, the imperial family, represented here on the terrace of the Palace of Schönbrunn. From time to time van Meytens produced updated versions to include the newest additions to the ruling couple’s increasing brood. This particular version was purchased during the 19th century by King Louis-Philippe and is now in the Versailles collections. There exists a later version that includes Marie-Antoinette’s younger brother, little Archduke Maximilian Franz.